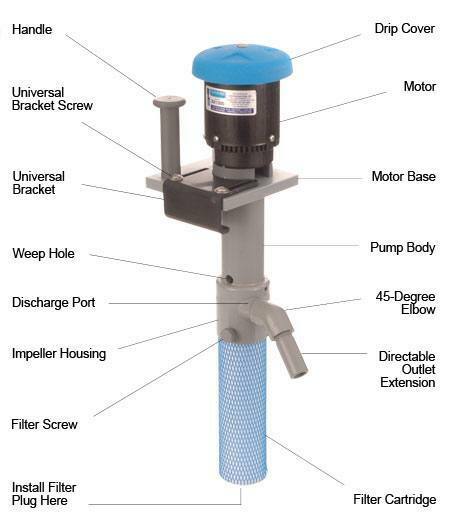 Flo King offers several pump models, as shown below. The flow rate is given in gph (gallons per hour) and LPH (liters per hour). 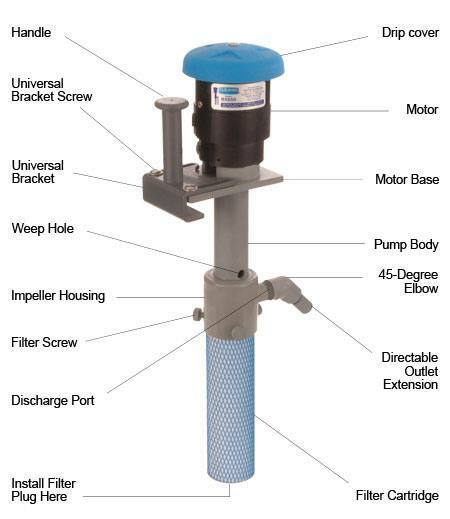 These units can be used as filter systems (with cartridges attached) or just as pumps (without filter cartridges). All employ the same principle of operation and can be used to pump, filter, agitate, and carbon treat. Selection should be based on a variety of considerations, including: tank size; degree of agitation desired; available space in tank; clearance above tank; temperature; and chemical composition. 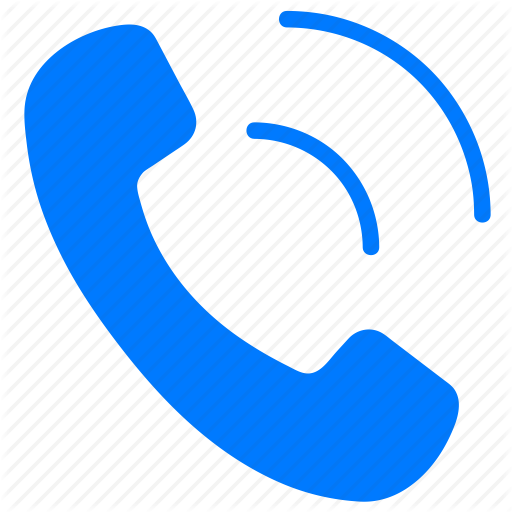 Please call for accesories or special applications. For laboratory, prototype and clean production operations in tanks smaller than 10 gallons (38 liters). Popular for precious metals plating and a host of applications in the electronics and decorative fields. Maximum flow rate is 400 gph (1500 LPH), depending on filter cartridges and attachments selected. Standard unit is made of polypropylene with 303 stainless steel shaft covered with Teflon shrink tubing. Pump also available on special-order basis in PVDF (Kynar) and stainless steel. Titanium shaft available as special-order item on certain body lengths for solutions that aggressively attack stainless steel. Up to 400 gallons (1500 liters) per hour at 60 Hz. A flow-rate reduction of about 18% is typical when operating at 50 Hz. Very little head pressure. Not intended for solution transfer. About 3 pounds (1.3 kg) in polypro, depending on pump body length. 1/70th horsepower (11 watt), 230 V, 50/60 Hz, 2600/3000 RPM, 0.48 A. Thermally Protected. Electrical cord is 10 feet (3 meters) long. The BX650 can be used in tanks as small as 10 gallons to a few hundred gallons (38 to about 1,000 L), depending on tank-turnover and agitation requirements. Pump provides maximum flow rate of 650 gallons per hour (2400 liters per hour) using a motor rated at 1/15th hp (50-watt). A good choice if tank is too large for the Lab Series but too small for the BX1200. Available in CPVC, polypropylene, and PVDF (Kynar) as pump materials of construction. Standard shaft is made of 303 stainless steel covered with Teflon heat-shrink tubing. As a precaution for aggressive solutions that may attack SS, a titanium shaft and a Hastelloy-C276-alloy shaft are available for pump-body lengths of 6, 8, and 10 inches. 650 gallons (2400 liters) per hour at 60 Hz. A flow-rate reduction of about 18% (plus or minus 3%) is typical when operating at 50 Hz. 10 feet (3 meters) of head pressure. About 9 pounds (4 kg) in CPVC, depending on pump body length. Lightweight, high-flow-rate, easy-to-use system is the industry workhorse. Features a 1/12th-hp (60-watt) motor and requires only a 4-in.-square (10-cm-sq) area of in-tank space yet provides vigorous agitation and a maximum flow rate of 1200 gph (4500 LPH). Remove filter cartridge and insert carbon-containing attachment to treat for organics. Available in CPVC, polypropylene, PVDF (Kynar), and stainless steel as pump materials of construction. Standard shaft is 303 stainless steel covered with Teflon heat-shrink tubing. As a precaution for aggressive solutions that may attack SS, a titanium shaft is available for pump-body lengths of 6, 8, 10, & 12 inches and a Hastelloy-C276-alloy shaft is available for pump-body lengths of 6, 8, 10, 12 & 14 inches. 1200 gallons (4500 liters) per hour at 60 Hz. A flow-rate reduction of about 18% is typical when operating at 50 Hz. 12 feet (3.6 meters) of head pressure. About 10 pounds (4.5 kg) in CPVC, depending on pump- body length. Low-profile, belt-drive unit is reserved for applications where above-tank clearance is limited. 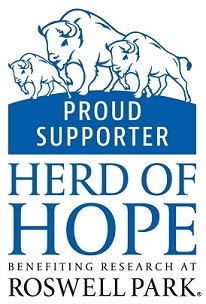 Provides a maximum flow rate of 2500 gph (9500 LPH). Inverted motor arrangement stands just 2 inches (5 cm) above tank. As with other larger models, Impeller Housing swivels to enable preferred positioning of Discharge Port and filter cartridges in tank. Available in CPVC, polypropylene, PVDF (Kynar), and stainless steel as pump materials of construction. Standard shaft is made of 303 stainless steel covered with Teflon shrink tubing. A 2-inch-long (5-cm) titanium-tip or Hastelloy-276C-alloy-tip shaft that threads onto the impeller is available on a special-order basis for solutions that aggressively attack stainless steel. 2500 gallons (9500 liters) per hour at 60 Hz. A flow-rate reduction of about 18% is typical when operating at 50 Hz. 27 feet (8.2 meters) of head pressure. Single phase, 1/3 HP (250 watt), 120/240 V, 6.0/3.0 A, 50/60 HZ, 2850/3450 RPM. 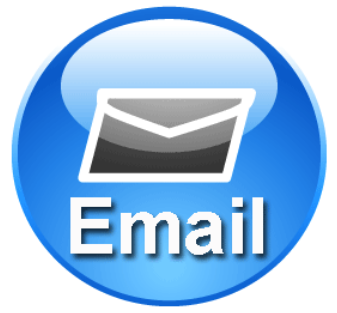 Call for information on 3-phase motors. Electrical cord is 10 feet long (3 meters). With standard BXL2500, width of tank lip or flange must be less than 3-1/2 inches (9 cm) due to fixed space between pump body and motor. Optional Long Motor Base accommodates tank mounting surfaces up to 6-1/2 inches (16 cm) wide. It weighs just over 20 lb (9 kg) yet offers a maximum flow rate of 3,000 gph (11,500 LPH). Can be used with one, two or even four filter cartridges. Like all Flo King pumps, the BX3000 prevents bath stratification by circulating to promote uniform temperature and chemical composition. Can also be used with carbon treatment accessories to remove organic impurities. Available in CPVC, polypropylene, PVDF (Kynar), and stainless steel as pump materials of construction. Standard shaft is made of 303 stainless steel covered with Teflon shrink tubing. For solutions that aggressively attack stainless steel, a titanium-tip or Hastelloy-276C-alloy-tip shaft that threads onto the impeller is available on special-order basis. 3000 gallons (11,500 liters) per hour at 60 Hz. A flow-rate reduction of about 18% is typical when operating at 50 Hz. About 24 pounds (10.5 kg) in CPVC, depending on pump- body length. Contact us for information on 3-phase motors. Excellent for larger tanks or anywhere aggressive agitation is desired. Operates with 3/4-hp motor and pumps a maximum of 5,000 gph (19,000 LPH) yet is still portable. Like other Flo King units, it is available in CPVC, polypropylene, stainless steel and PVDF (Kynar), and can be used with reusable or disposable filter cartridges. Available for single-phase or three-phase electrical service. Available in CPVC, polypropylene, PVDF (Kynar), and stainless steel (see Bulletin 23.5) as pump materials of construction. Standard shaft is made of 303 stainless steel covered with Teflon shrink tubing. For solutions that aggressively attack stainless steel, a titanium-tip or Hastelloy-276C-alloy-tip shaft that threads onto the impeller is available on special-order basis. 5000 gallons (19,000 liters) per hour at 60 Hz. A flow-rate reduction of about 18% is typical when operating at 50 Hz. About 29 pounds (13 kg) in CPVC, depending on pump body length. Like the BXL2500, this unit features a low-profile design to avoid above-tank obstructions. But at a maximum 5000 gph (19,000 LPH), it offers twice the flow rate. 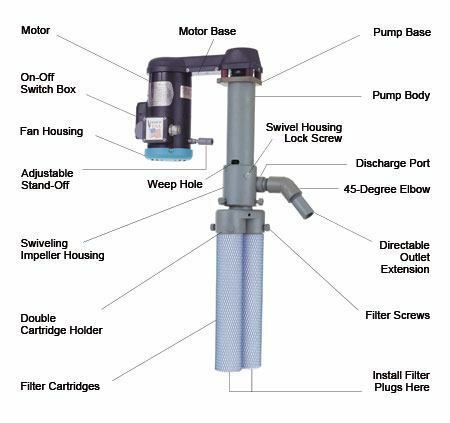 Accepts full complement of accessories, including Slide-In Filter Cartridge Adapter for changing filter cartridges without moving pump from tank. Low-profile belt-drive units are used where above-tank clearance is limited. About 29 pounds (13 kg) in CPVC, depending on pump- body length. Maximize filter surface area in solution. Eliminates clamps, wires, screws, and other means of securing system to tank. Will not corrode and contaminate solution like mateal clamps. When using a Flo King for filtration, the filter cartridge is totally immersed in solution. Most customers simply attach a bare filter cartridge to the pump, and nothing else is required. However, in some cases, solids may slough off the cartridge either because of their size (large) or disposition (do not adhere well). The Trash Trap surrounds the filter cartridge and keeps dirt, metal shavings, and other large particles in the canisterâ€”and out of the tank. The Kurt Tube is a sparger accessory that provides a highly uniform, unidirectional source of agitation that can be directed toward the workpiece or other tank area. Although most customers use the standard 45- or 90-degree elbow on the pump Discharge Port, the Kurt Tube is sometimes preferred for special applications and can be positioned horizontally or vertically as needed. 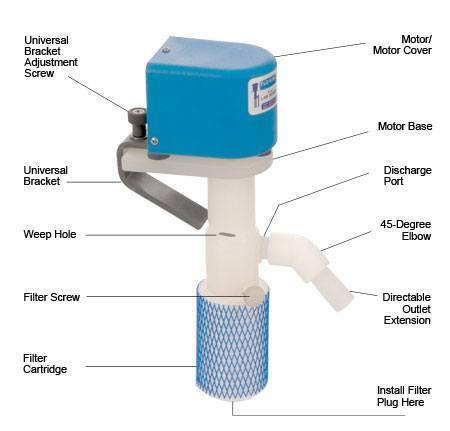 In most cases, users change filter cartridges by leaning back the Flo King pump or removing it from the tank. However, when using the larger, heavier models, or where access is difficult, the SIFCA allows you to change filter cartridges without moving the pump at all. Lift to disconnect, lower to reconnect. No tools required. Compatible with the BX1200, BX3000, BX5000, BXL2500 and BXL5000 models. Removes floating particulates and lightweight surface oil to help prevent voids in the finish. Solution is drawn by vacuum through slots on the polypropylene Skimmer Trash Trap and through the Skimmer Head, which floats on the surface. A filter cartridge removes the contaminants, then solution is discharged from the pump to create agitation. Note: Skimmer is not intended for heavy oil or large volumes of oil. Flo King systems are built to provide high flow rate and solution agitationâ€”even without the aid of spargers. However, where piping is desired to agitate a more selective area of the tank or to agitate from the bottom up, for example, tapered Floductor nozzles are available. Use a pump with Floductors exclusively to agitate solution (as shown at left) or to filter, too. Important: Floductors do not increase the flow rate or agitation of the Flo King pump; rather, they redistribute the flow to the desired area of the tank. 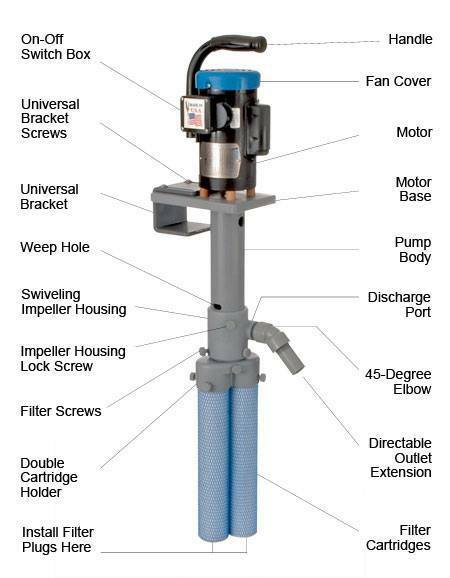 Flo King high temperature accessories allow you to use your Flo King filter system for many different operations. Consists of a Standard Magnum Core, reusable filter blanket, and Web. 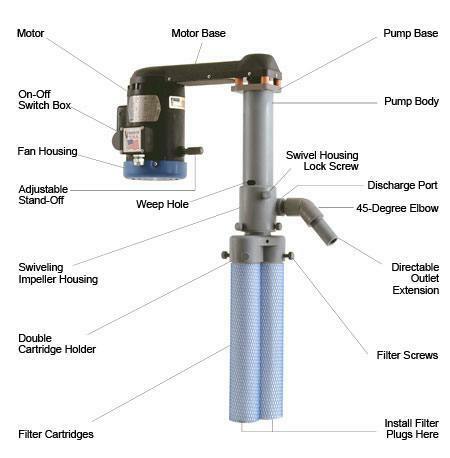 Simply insert the cartridge into the Flo King pump and tighten the Filter Screws onto the rolled filter blanket. The Magnum blanket is made from polypropylene, is available in 10, 5 and 1 micron, and is compatible with many metal-finishing solutions up to 200 F (93 C). It can be used on Flo King in-tank pumps or in out-of-tank filter chambers. Many electroplating solutions require periodic or continuous carbon treatment to remove organic impurities. Fortunately, in-tank carbon treatment using Flo King products is a relatively simple and inexpensive way of removing these undesirable organics without leaks or spills. Depending on tank size, type of solution, and other variables, you can use Flo King Carbon Cartridges, Carbon Bags, and Carbon/Resin Canisters. 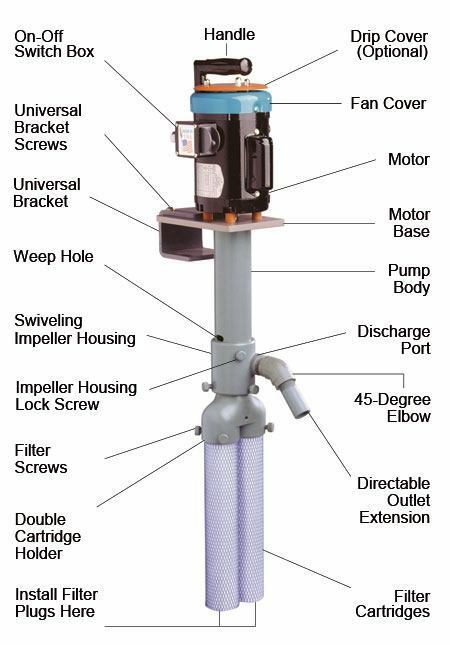 All of these products can be attached to the Flo King pump quickly and easily. Flo King High-Flow Carbon Cartridges are the natural choice for most plating and related solutions. They are made of 100% polypropylene, with absolutely no materials of construction that can deteriorate in solution. They also contain Flo King High-Tech Acid-Washed Pelletized Carbon - a clean, highly adsorbent material whose uniform shape enables more efficient loading than granular carbon allows. Carbon Cartridge Size: Outside Diameter, 2-1/2 inches (6.35 cm); hole diameter, 1 inch (2.5 cm); lengths, 4, 6, 10, 15, 20 & 30 inches (10, 15, 25, 38, 50 & 75 cm). As a general rule, use 10 inches (25 cm) of carbon cartridge length for each 100 gallons (380 liters) of solution. After using the cartridge, dispose of it in accordance with appropriate environmental regulations. The reusable Carbon/Resin Canister (CRC) is made of a porous polypropylene tube with internal filter cartridge. Add pelletized carbon to capture organic impurities. Sturdy tube construction provides long-term durability and facilitates refills. Available in lengths of 6, 10, 15 and 20 inches and in 4-1/2 inches and 7 inches in diameter (11.5 and 18 cm). Carbon capacity ranges from 1 to 9 lb (0.45 to 9 kg). Some operators even use the CRC with ion-exchange resin to remove metallic contaminants from small tanks. For larger tanks or where organic contamination is severe, Flo King offers the Carbon Bag for in-tank treatment. The bags come in three lengths (10, 15 and 20 inches; 25, 38 and 50 cm) with the capacity to hold 5, 7.5, and 10 lb (2.3, 3.5 and 4.5 kg) of pelletized carbon. Use the standard disposable bag for one-time treatment; or, for repeated use, select the Permacore reusable bag, which can be emptied, cleaned, refilled with carbon and reused many times. Flo King offers two types of Pelletized Carbon - HIGH GRADE for non-critical applications and acid-washed HIGH TECH for most plating applications. All Flo King carbon cartridges are loaded with High Tech carbon.